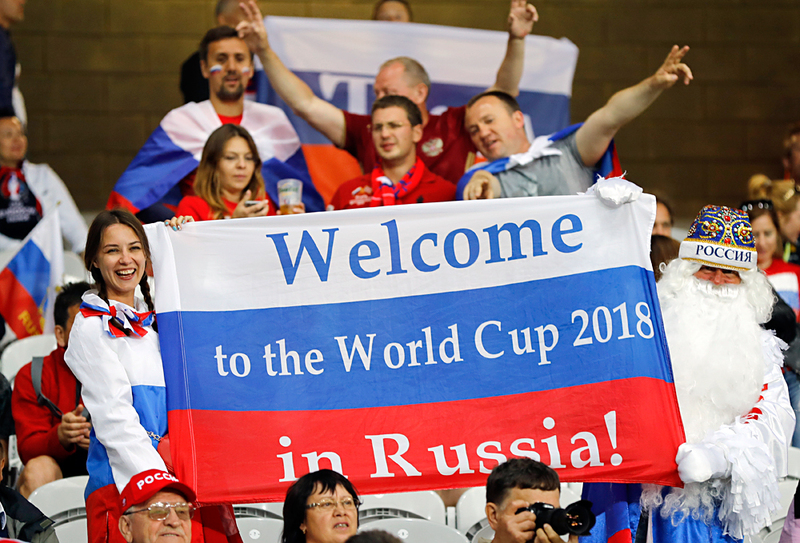 Russian supporters hold a flag reading "Welcome to the World Cup 2018 in Russia", s they wait for the start of the Euro 2016 Group B soccer match between Russia and Slovakia at the Pierre Mauroy stadium in Villeneuve d’Ascq, near Lille, France, Wednesday, June 15, 2016. Over 100,000 people have submitted personal applications to serve as volunteers at the 2018 FIFA World Cup, to be hosted by 11 Russian cities, a senior official in charge of the competition announced on Monday, Sept. 5. Director General of the Local Organizing Committee (LOC) Russia-2018 Alexei Sorokin, announced in his Twitter account that Monday, "marked the 100,000th volunteer application." "Thank you everyone, wishing to stage the world’s best ever championship," Sorokin said. The 2018 World Cup and the 2017 Confederations Cup Volunteer Recruitment campaign was launched at a solemn ceremony in Moscow on June 1 by Russian President Vladimir Putin and FIFA President Gianni Infantino. The matches of the 2018 World Cup will be held between June 14 and July 15 at 12 stadiums. Two of the stadiums are located in Moscow.